Rune Cygan Barslund, born in May 1988, started at the age of six to play Danish but also Irish folk music under the tuition of Bent Melvej at Viborg Music School. In addition to this, Rune later had lessons with great teachers like Jytte von Rüden, Carl Erik Lundgaard and Pavlina Salehi. They gave him lessons in everything from Bulgarian and Danish folk music to classical accordion. When Rune and Aske Ruhe in 2002 established the duo, Barslund and Ruhe, Rune had at the same time started to play the whistle. In 2005 they met Oisín Walsh and Kasír was founded. Their debut album, Reel Irish, was in 2007 nominated for two Danish Music Awards Folk for "Best Traditional Artist" and "Best Debut Album." Currently Rune is studying at the Folk Music Department of The Carl Nielsen Academy of Music in Odense where he lives. Apart from studying, Rune is playing concerts with Kasír, writing music and teaching whistle and accordion. "I play whistles made by Colin Goldie because I think they have a fantastic sound and I find them very easy to play. No matter if you choose a nontunable or a tunable model, the instrument is always perfectly in tune. If you buy a tunable model you will be able to adjust the whistle to other instruments that cannot be tuned, also you won't have to worry if the place that you play in is too cold or too hot, because you can just tune the whistle up or down if the temperature affects it. 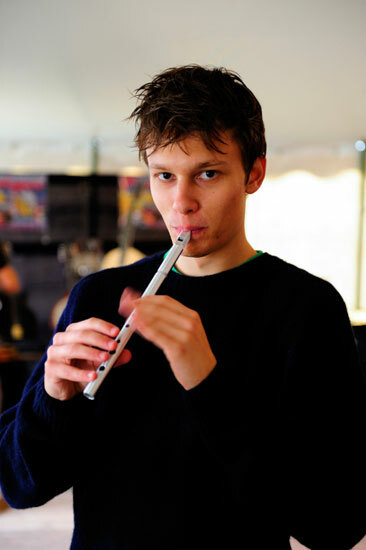 As all of Colin’s whistles are handmade, he is able to make the instrument so it will fit exactly to the wishes you might have and to your playing style. I find this very important, as it is very personal what you find good about a whistle. You can be sure to get a good service from Colin and his wife Brigitte and they will always take the time to give you advice about playing and about all kinds of whistle stuff in general. If you are a beginner or advanced player, he will be able to help you to choose the right whistle as he is a very fine whistle player himself."